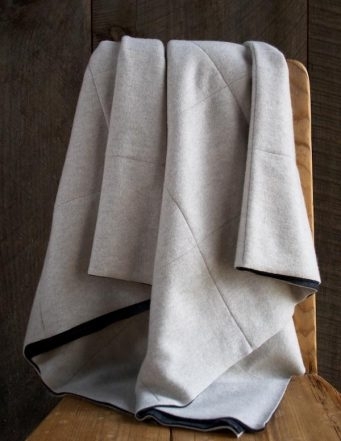 When I first touched our extraordinary Lana Cotta Canberra felted wool fabric my head began to dance with ideas of wool everything: wool shorts, wool tee shirts and wool tablecloths. 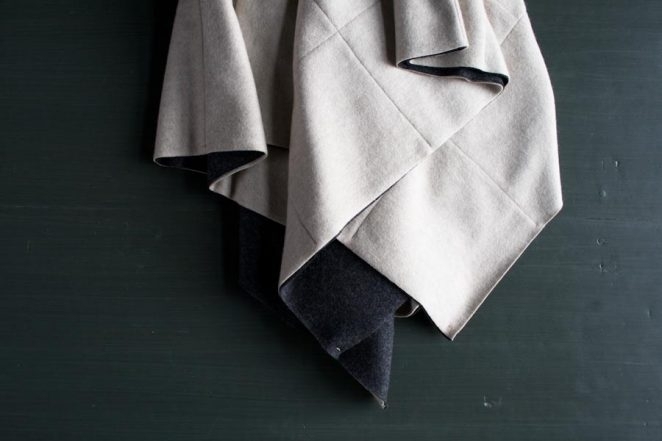 But before I got too far ahead of myself (are wool napkins a thing? 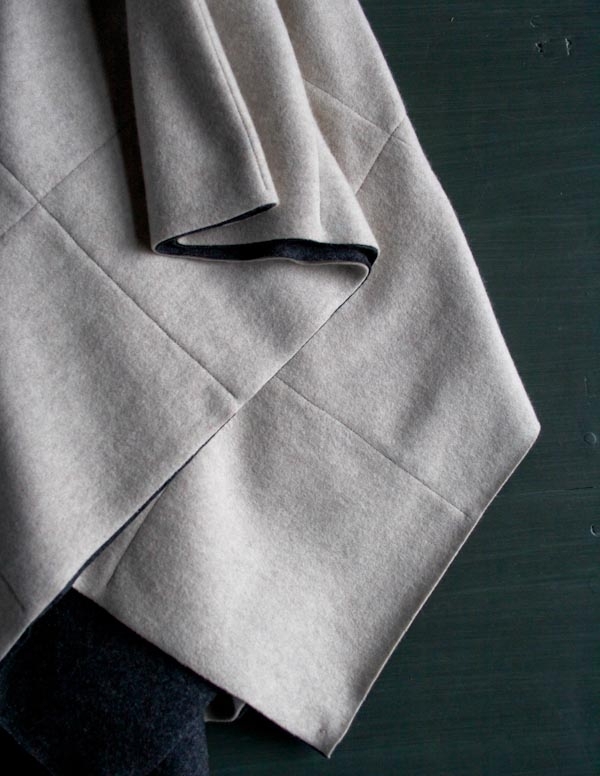 ), I decided to make something simple, straightforward and essential: a beautiful throw blanket. You will also need masking tape, a rotary cutter, a long rotary cutter ruler, a quilting foot for your machine, and a clean section of hard floor (without rugs or carpet) at least 60 inches square. NOTE: This pattern is available as a printer-friendly PDF! Just click here. 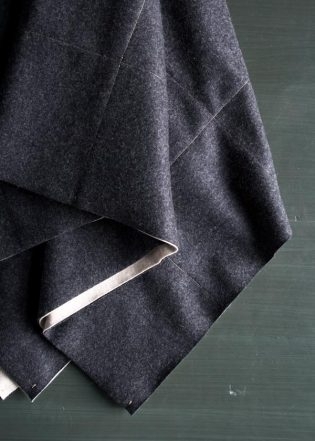 Press the Dark Piece of fabric and then lay it down flat on a clean, hard surface, like the kitchen floor. Using the masking tape, tape the Dark Piece down to the floor around all four sides, pulling it taut as you tape. First tack down the centers of the opposite sides and then tape along each side, from the center out. Once the Dark Piece is taped down, fold and press the Light Piece into quarters so there are two perpendicular crease marks that meet in the center. These are the Horizontal and Vertical Center Lines. Lay the Light Piece flush on top of the Dark Piece. Do not tape down the Light Piece but do make sure that it’s flat and smooth and that you can see the Center Lines clearly. Using a long ruler so that your lines are very straight, use the water-soluble pen to mark the entire length of the Horizontal and Vertical Center Lines. Make sure that they are totally perpendicular to one another. This is important because they will be your guides for all of the marking. 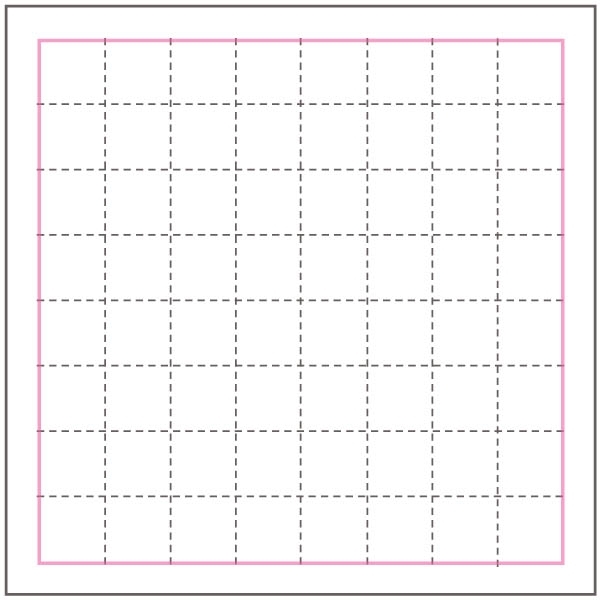 You will now mark the Light Piece with a 6-inch grid. 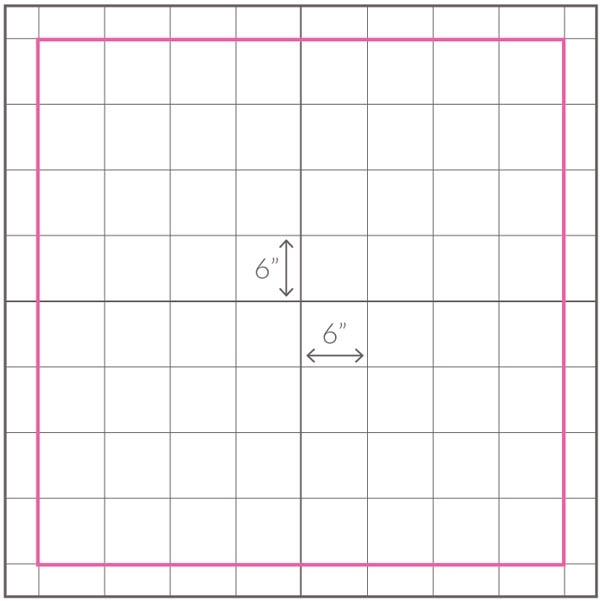 To begin the grid, mark a line 6 inches above and parallel to the Horizontal Center Line across the whole width of the fabric. Then mark another line 6 inches above and parallel to this line. Repeat until there are four parallel lines above the Horizontal Center Line, each 6 inches from the line below it. Then, below the Horizontal Center Line, mark four parallel lines, each 6 inches from the line above it. 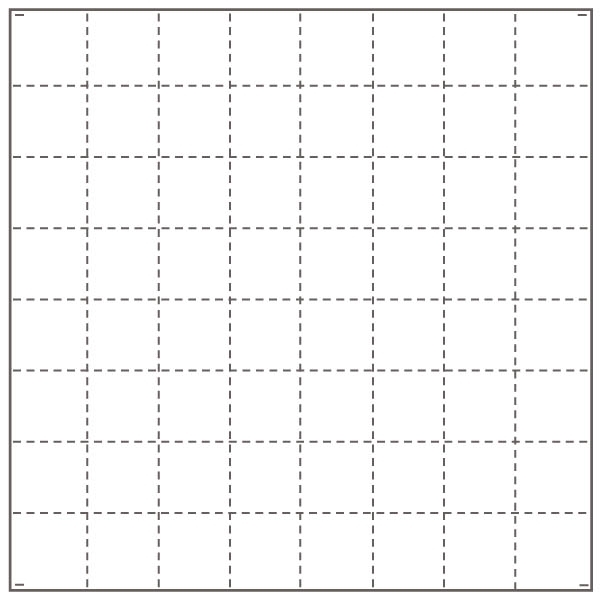 To mark the vertical lines of the grid proceed in the same manner, moving outwards from the Vertical Center Line as you mark. First make four parallel lines 6 inches apart from one another to the right of the Vertical Center Line and then four parallel lines 6 inches apart from one another to the left. The Light Piece is now marked with a 6-inch grid of 9 vertical lines and 9 horizontal lines. 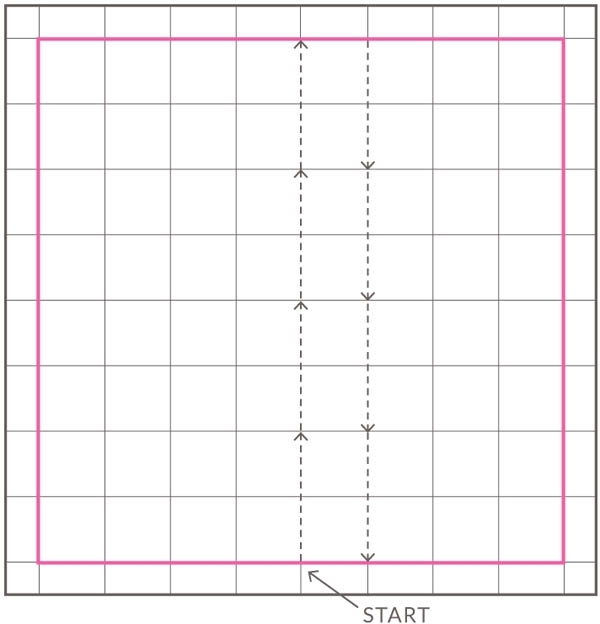 The very outside lines (shown in pink in the diagram) are now called the Border Lines. It will be mentioned again, but it’s very important to note that you will not be quilting the Border Lines; they are just a guide and will remain unsewn. Using the curved safety pins, pin the two Pieces every 3-4 inches, starting in the center and working your way outward. Pin only inside of the grid squares and avoid pinning on any of the marked lines. Make sure that the Light Piece remains flat and smooth on top of the Dark Piece as you go. When the entire piece is basted remove the tape and take it off of the floor. You will now quilt the two pieces together along the marked lines, first sewing all the vertical lines and then all the horizontal lines. Remember, you will not quilt the Border Lines. Use your machine’s quilting foot and the Cotton Thread to do all of the sewing. Start with the Vertical Center Line: You will begin at the point where the Vertical Center Line intersects with the bottom Border Line. 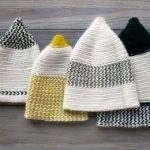 Begin by sewing along the line with a very, very small stitch length for ½ an inch. (This avoids having to backstitch to secure the line of sewing.) 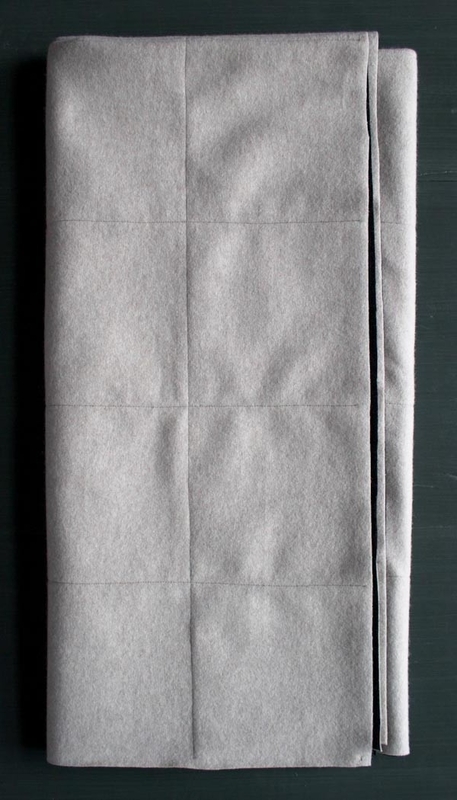 Then with a regular stitch length, continue sewing carefully along the line all the way to ½ inch before the opposite Border Line. 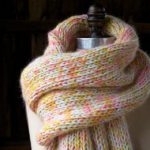 Switch to the small stitch length again, sew until you reach the Border line and then stop. To sew the next line pick up your foot and needle but do not cut the thread. 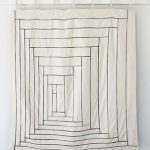 Rotate the quilt 180 degrees and then sew along the vertical line to the left of the previously sewn line in the same manner, with ½ inch of very small stitching at the beginning and end. Make sure to start and stop exactly at the Border Lines. Now clip off all the lengths of thread connecting the beginning and end of each line Trim them right at the border lines and trim any other extra threads too. Next, quilt all of the Horizontal lines in the same manner: Alternate directions and first sew across the three lines to one side of the Center Line and then across the three lines on the other side. Trim all of the Horizontal threads and remove all the curved safety pins. When you are done sewing over all of the lines, the quilting will look like a big game of tic-tac-toe, a grid without a border around it. Spray water over all of the marked lines to make them disappear. 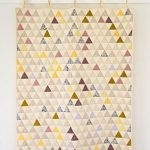 Using a rotary cutter and rotary cutting ruler, cut all four sides of the quilt ¼ inch outside the Border Lines. 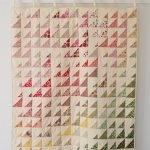 Do this slowly and carefully because this will be the final finished edge of your quilt. 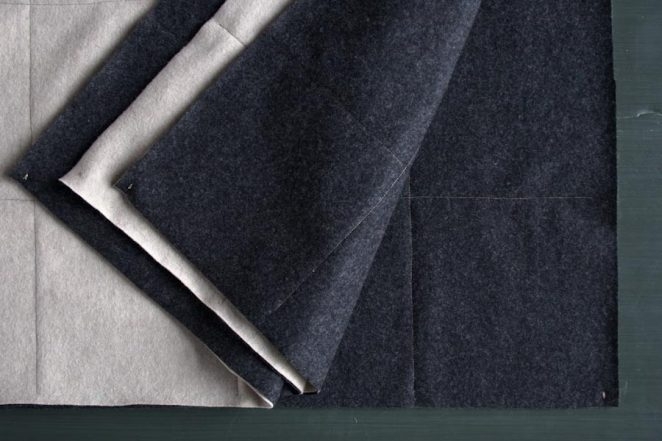 To secure the corners make a ¼-inch tacking stitch at each of the quilt’s four corners, ¼ inch from both edges. Love the new print option! Fantastic pattern as well!! Lovely, but why do you not sew the edges together. And is this wool washable or dry clean only? We liked the spareness and simplicity of the un-sewn edges. It also makes the whole blanket drape a bit more freely. 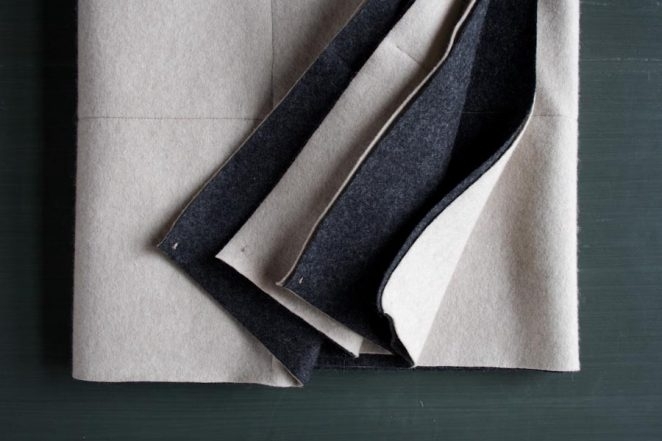 However, you can certainly sew the edges together. You would just sew along what I call the “Boarder Lines” in the pattern. 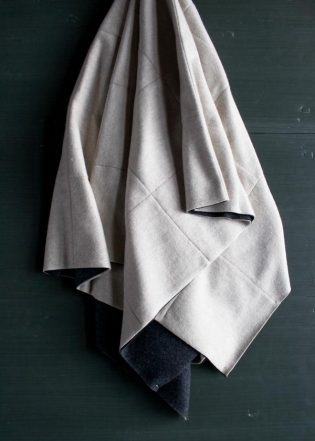 We recommend handwashing or drycleaning this wool. 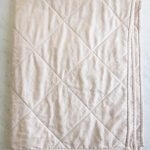 However, if you really want to make something that is machine washable you can prewash and dry it before you sew with it. It will continue to felt a bit every time you wash it but it won’t be too noticeable and actually the slight puckering can look nice! I was lucky to be gifted this gorgeous, gorgeous wool for Christmas, and used most of it to make a similar version of this quilt, with heavyweight flannel for the backing. I bound the edges with contrasting Line Weight wool yarn, using the buttonhole stitch. 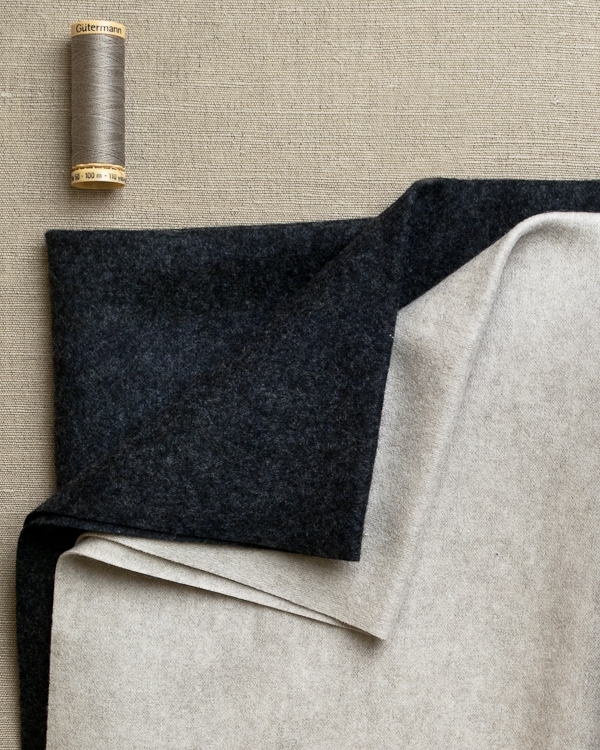 I cannot believe how really luxurious this wool feels! It’s just beautiful and has such a great hand to it! Wow, your project sounds gorgeous! We’d love to see a picture if you’re able to post one on Instagram (and tag @purlsoho) or on Facebook or Twitter.